Earlier this week I made a little video about the Time Magazine Cover and I wondered aloud (once again) if Mom Blogging is good for kids. The feedback I got was mostly unrelated to the content of the video. It was more like: The hair! You have a great blowout. I did it myself. I had a good haircut (for a change) and I learned a few tricks. Basically the folks at Wella saw my constant updates about my bad haircuts and bigoted hairdressers and took pity on me. Sometime before the awards season they wanted Jane and me to see one of their hairdressers for color and styling. They wanted us to bring in pictures of red carpet hair and they’d provide the styling. That never happened. With sports and travel and life it was virtually impossible to get myself and my daughter to have a few free hours on the same day. We were trying for a February appointment and the first available date was April 14. It wasn’t them. It was me. Anyhow, for the first time since I was a preadolescent I had a haircut outside of the Cristophe Salon. Jane and I walked into The C Salon in Studio City and everything was the same as every other salon but everything was also different. It’s a beautiful and noisy space, chatter, blow dryers and music keep it loud and lively. What was noticeably missing was the attitude. I typically hate the salon experience because of the prettier than thou attitide and not one person at The C Salon had it. The receptionists were warm and welcoming, all the hairdressers made eye contact and smiled. Everyone seemed to be happy to be there. This shouldn’t be remarkable but sadly it is. Jane was looking for some highlights and I wasn’t sure what to expect but when Tiffany came out with a big smile, the perfect pink lipstick (deemed perfect by Jane) and a tutu-like skirt I knew we had the perfect hairdresser for my 13 year old. I just didn’t know if she was to be trusted. I hovered a little reminding her that we were looking for subtle and she nodded and assured me it would be natural and pretty and would please us both. Did it ever. 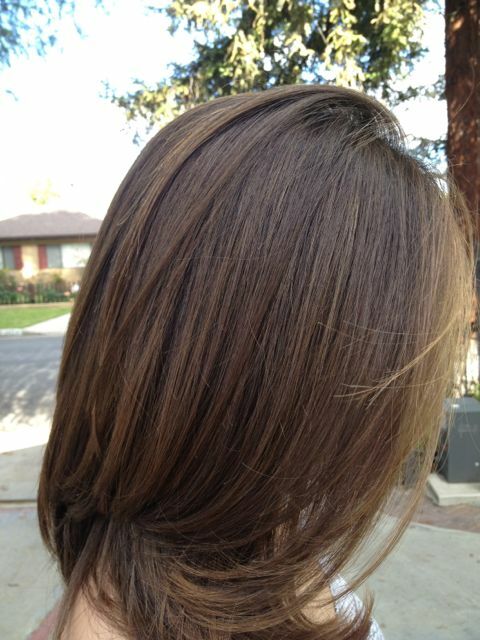 Are these the most natural looking highlights you’ve ever seen? In addition to being pretty and trendy Tiffany is a foster mother and was telling Jane about her kids. Atypical discussion for a hair salon but totally refreshing and much needed. I ended up having a cut and style with the owner of the salon Claudio Lazo. As we got to talking we realized that our daughters had played soccer at the same park for the past seven years and that they’d been on a team together for a Thanksgiving tournament last year. As we chatted it became apparent that Claudio set the tone at the salon. You’d think I’d be relaxed at this point but I really wasn’t. As much as I’d become unhappy with my hairdresser before him I wasn’t particularly trusting. We talked a lot about styling and he told me he teaches classes that are hours long on how to make a ponytail. Apparently to get a runway ponytail you start with a triangle of hair where the pony will sit and you add hair tiny bits at a time to it. I might ask him to make a video with me if y’all want to learn a bit about a runway ponytail. While Claudio was trimming my hair he mentioned cutting it a little shorter in the front because of my high cheekbones…. uh yeah. If by “high cheekbones” he meant “chubby cheeks” then he was spot on. It was just so refreshing to have someone speak to me kindly. Why am I so slow to change? I do a good blowdry for myself but as my hair has straightened out in the last few years I’ve not known how to get body into it other than with different sizes of round brushes, this is an exhausting process. 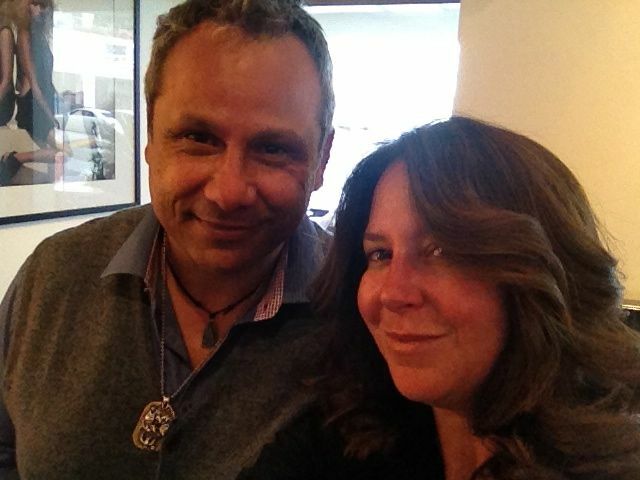 Claudio gave me a few tips about getting those beachy waves we all love. use your fingertips to pull down a few strands from each curl not so much brushing as pulling and positioning. It’s been a month since my cut and styling and it’s still a good haircut. That’s me with not a stitch of makeup. I told you I don’t have time for anything. yes, i’d like to see a video of the runway ponytail! And JG – honestly I’ve had full-on discussions with friends about the heck you do the things you do. Are you hiding a twin somewhere? We marvel. I’m late just about everywhere I go but I’m working on it and I’ve found that I’m okay doing too many things not very well. RUNWAY PONYTAIL NOW! I don’t even own a blow dryer but I am dying to learn how to do that. Yes yes yes. That was what I was thinking the whole time when I watched your vid. Several on YouTube commented on how hot you are. :-) It made me smile. Claudio is truly an asset to our industry and is well respected by his peers across Southern California and the US. 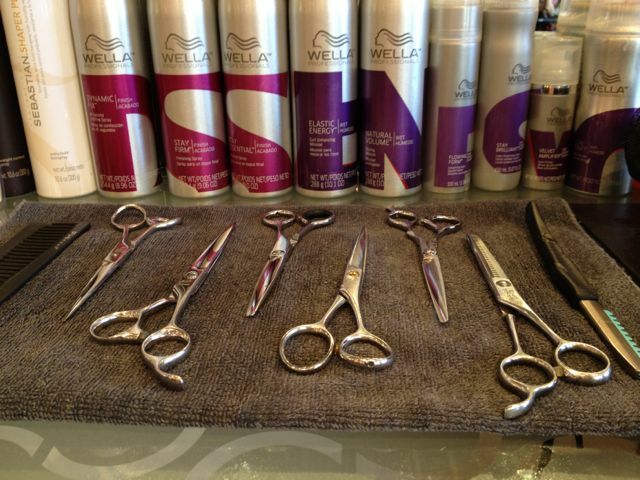 He also teaches advanced training for hairdressers in LA and NY at the Wella Studios. I love this beachy wavy do on you! So fresh and natural looking! I would love a video on beachy and runway pony … pretty please! Yes, make the ponytail video!